Atom Productions resurrects one of London’s most hair-raising psychedelic adventures, first born 10 years ago in the depths of the London underground. With Halloween looming, this is the perfect opportunity to dig out your fancy dress, fake blood, latex skin and dancing shoes. Fear not if you have none of these, our special Halloween task force will ensure you look the part! The main room of the BoomBox Lab will be transformed into the World Lounge Project psychedelic ballroom with plenty of comfy couches and chill spaces, while room 2 will be transfigured into a Psy Laboratory with our friends from Bom Shanka Music joining the party to celebrate a decade of devious hard and dark devastation with a rare 3-hour set. £15 advance tickets on sale now! Very excited and honoured to be part of such a great line-up! btw there's a ticket comp on the main page you might be interested in! Most definitely! It has been way way too long! For The Return of the Atom, Spinney Lainey has put together a brand new band, Cosmic Creatures. Don't miss their debut performance, with Lainey on flute, Kartik Raghunathan on violin, Lydia Angelica Cox on keyboard and Sheila Stocking on drums. Mutaliens aka Matt Mif aka Contineum got his first decks at 13 and has been refining his craft ever since. After many years grafting away at his own label, Mutagen Records, he’s now signed to the epic Looney Moon Records, where his sophisticated hard and dark psychedelic productions are right at home. 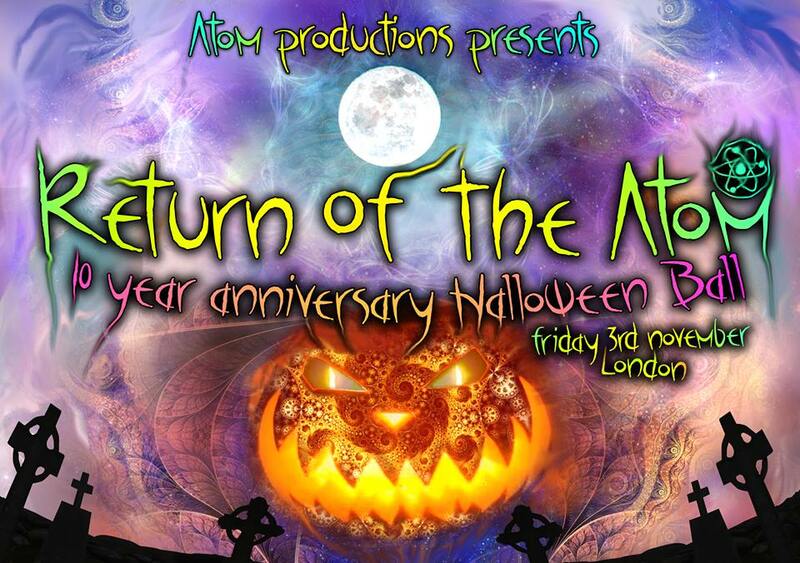 Strap yourself in and check out his epic Mutaliens mix for Radiozora for a taste of what’s to come next Friday night at the Return of the Atom 10-year Anniversary Halloween Ball! Limited advance tickets are still on sale from Access All Areas Network. 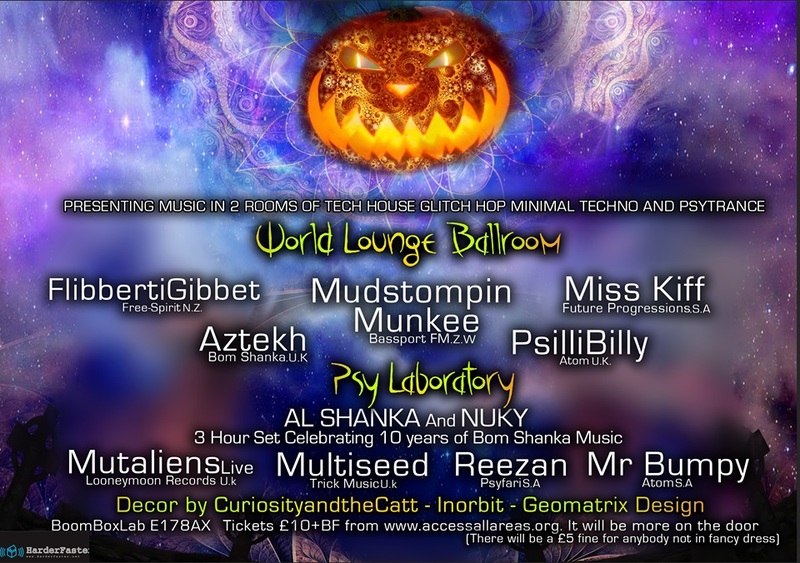 £10 advance tickets on sale now! 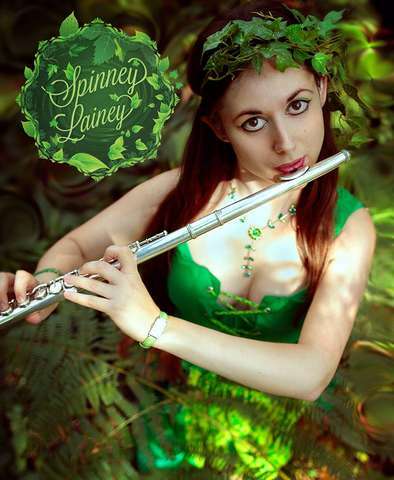 Spinney Lainey's passion for music started at the age of 8, when she began to learn the flute. She went on to graduate with a Classical Music Degree but her love for producing psychedelic music came later when she was discovered by Serbian psy trance producer Zyce who asked her to record a flute part for the track 'Basic' and a further 5 tracks in total, including the EP, Fluting, which was no. 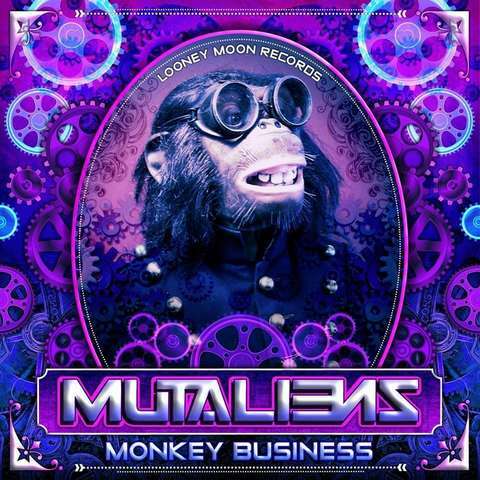 1 on Beatport. Lainey went on to work with many other producers in the scene, including Lyctum, Flegma, Mindwave, Starlab, Pulsar & Thaihanu, Elegy, Argonnight, Axer & Shabot, Alpha & Omega, Dreamstate, Moon Tripper, Zweep and Agent Kritsek. Lainey plays live flute with electronic effects, interwoven with her own melodic, progressive psytrance compositions and has been performing at festivals and parties, since 2005. She joins us for our 10 year anniversary this time with her brand new band, Cosmic Creatures featuring Kartik Raghunathan, Sheila Stocking and Lydia Cox. Expect a hugely entertaining live performance from these artists performing tracks such as 'Portal', 'Wings of Hope' and 'Ascension'. Here's a little taster!